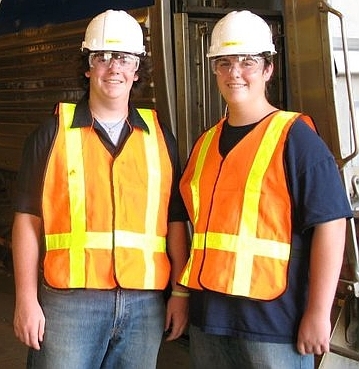 A week at Rail Camp – Volunteer Railroader Association Inc. This July, I had the fortune of attending Railcamp thanks to the financial aid from the VRA and the Joseph Weber Memorial Fund. With my brother Matt, who was sponsored by the Jersey Central Chapter of the NRHS, spent six days in Scranton with twenty-two other rail enthusiasts from ages 14 to 18. I speak for myself, my brother, and all of the other campers when I say we all had the time of our life. Our first day began with a five AM wake up call at our dorm at the University of Scranton. We boarded a bus and took a trip to Wilmington and Bear, Delaware for a rare unseen tour of Amtrak’s locomotive and car shops. Inside we saw various locomotives and coaches undergoing a complete overhaul, being refurbished, or having repairs done. This was a unique experience because only a small handful of groups, such as ourselves, and the employees get to see the inside of the shops. We took a different route back to Scranton through Harrisburg to see the inside of Harris tower. On day two we were given a lesson by the park rangers on how to do a “railroad interpretive program” in which the park ranger taught us the ways in which they teach the history of railroading to the public at the museum. We were split up into a group and we were each assigned to a car or locomotive. My group and I explained the mechanics of a steam locomotive. In the afternoon we took a tour of the Anthracite Museum and the Lackawanna Coal Mine. One of the important things Railcamp tries to do is to inspire young people such as ourselves to get careers in railroading. They told us that with the growing industry, new opportunities will be open to people like us looking towards a career with the railroad. On day three we were given a lesson on Maintenance of Way procedure and also had a chance to meet 5 employees from Amtrak who described the company and they’re jobs. We were also given a lesson by Mike Muldowney, one of the councilors, on Steam generation in locomotives which I found to be quite interesting because I have not been taught about steam in that kind of detail. Day four brought us to the Steamtown shops where we got an in-depth look into what the Steamtown employees do. We were able to go into the firebox of a locomotive under repair, walk in the inspection pit underneath a fired steam locomotive, change a brake shoe, as well as look at the way all the locomotives and cars are inspected and repaired. The last day was the most everyone’s favorite. The last day gave us a chance to climb into the cab of the Nickel Plate 514 and operate a real diesel locomotive. We also learned hand signals and made a hitch with the locomotive and cars. We also were able to take a ride in a hi-rail truck and operate a one eighth scale steam locomotive. Railcamp was one of the best weeks of my life. I met a group of people that I will never forget, campers and councilors both included. I had experiences I will never have again and I owe it all to the VRA. Without their help, I would have never been able to go and I am tremendously grateful. 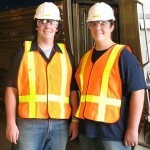 Railcamp is an experience that every high school student with an interest in trains should have. It is a week you will never forget. That sounds fantastic guys! I am very glad to hear you both had a great time and that the VRA was able to get you there! !